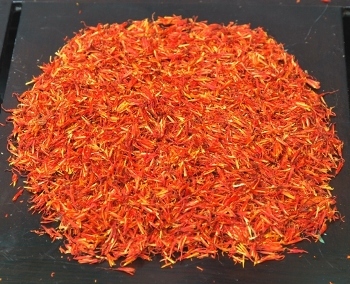 Safflower tea: 100% pure dried Safflower petals from Thailand for the preparation as tea / herbal tea / herbal tisane / ice tea. 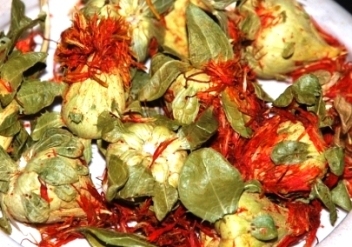 Safflower, general: the safflower plant, a fast growing, thistle-like, year-long herbaceous plant belonging to the Aster family that naturally occurs in countries across Asia, Europe, North America and Australia has first been used as medicinal plant in Egypt around 3500 BC for the manufacturing of ointments. The tea obtained from the flower petals has also been used for milleniums in Chinese traditional medicine for the prevention and treatment of multiple conditions. Apart from its medicinal use, the plant has been serving as a dying agent donor in the past and nowadays is still used as a substitute for safron in cookery and as an ornamental garden plant or as cut or dried flower. 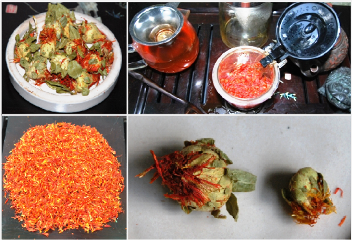 In Thailand, Safflower tea is also believed to have aphrodsiac properties. Here, a tea called “Love Potion No.1”, which consists mainly of safflower petals, is offered. Safflower tea should be infused 3 – 5 minutes at a water temperature of 90°C and is good for 2-3 infusions, depending on the duration of the individual infusion periods. Though Safflower Tea is generally regarded as a “soft medecine” without any undesirable side effects, and for example in Russia given to babies for inflatulence, the consumption during pregnancy is discouraged. I was looking for this tea for ages and was very happy to find it here on SiamTee e-shop. Tea is delicious and is very good for digestion problems. In my case it is used to treating Psoriasis. I am also very satisfied with SiamTee customer care and the simplicity of the ordering process. There were no problems with payment, even it was send abroad, and the delivered teas were in perfect condition.